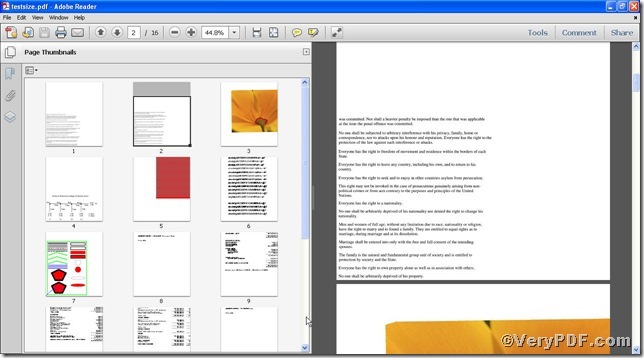 You do remember that the VeryPDF.com has shown you how to set page magnification, adjust the pages magnification to certain size in terms of comfortable reading, convenient view and something else. But you surely encounter with the problem that you just adjust the content within a page, you could not edit the page size in itself. 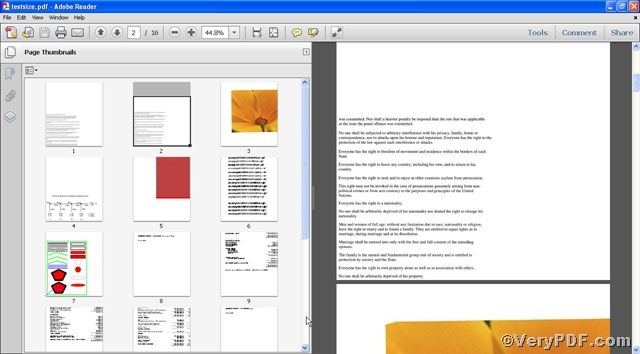 Based on this, the VeryPDF.com will explain you how to edit pdf page size using Advanced PDF Tools Command Line. so you will see the MS-DOS command prompt window. pdftools -i "C:\input.pdf" -o "C:\output.pdf" -x "llx lly urx ury"
where the parameter "llx lly urx ury" is a form of rectangles, which is described in remark one. then assumed to have coordinates (llx, ury) and (urx, lly). pdftools -i "C:\input.pdf" -o "C:\output.pdf" -x "0 0 800 900"
this window tells you your operation goes smoothly. If you have any questions, please don not hesitate to leave your comment below. Convert pcl to bmp and set page size via command line? This entry was posted in Advanced PDF Tools and tagged Advanced PDF Tools Command Line, command line, edit pdf, page size. Bookmark the permalink.